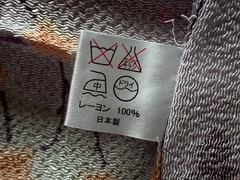 Have you noticed the laundry labels on clothing lately? Seriously, what do those cryptic symbols even mean? It seems that nobody really knows. On Good Morning America yesterday they put up several of those laundry symbols, and the guesses were kind of hilarious, but nobody got them right. Are those symbols supposed to make things easier? Or just confuse us all so we wash things wrong, ruin them, and have to buy new clothes? Why can't they just use words? I hate the dumbing down of everything - from laundry tags to street signs. Are we just assuming that people can't read, but they'll be smart enough to decipher the symbols? How's that working? I can read, but most of those symbols make absolutely no sense to me. If we really think that people who can't read can decipher those cryptic little symbols, why don't we just let them decipher the usual symbols - called letters. Formed into words.